What happens when you have pancreatic cancer? How does a person suffer from this condition? Are there things you must do to protect your pancreas and avoid having cancer? Let these questions be your guide in finding information about pancreas and pancreatic cancer, most especially. The production of insulin, which is able to normalize the blood sugar level of the body, is the primary function of pancreas. It means that it is very essential to keep your sugar level balanced. It must not be too high or too low. Abnormal level of sugar can create health problem, which include pancreatic and diabetes. Other than insulin, pancreas has the function to produce pancreatic juice. This is very much helpful in the process of digesting food. Both of the functions of pancreas are vital to the body. So, this organ greatly concerns the health just like other body parts. 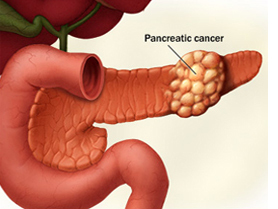 Cancer in the pancreas occurs if there is abnormal growth of cells that are malignant. The normal cells are replaced by life-threatening cells, which provide both pain and discomfort, or worse death. A person may not know he has pancreatic cancer until it is already in its later stage. This particular cancer is difficult to diagnose, especially during the early stages. It is also complex to diagnose this kind of health condition. Signs and symptoms may not be felt that easy. In fact, it has limited indicators before it develops or spreads all over your body. A doctor basically performs physical and history exam to confirm the possibility of cancer in the pancreas. Other than those, imaging tests like ultrasound, CT scanning, and endoscopic ultrasonography or endoscopic retrograde cholangiopancreatography are conducted. Like other cancers, pancreatic cancer is a silent disease, because an individual will not feel yet any pain while it is growing in the body. In most cases, the signs and symptoms are only felt when the cancer has grown and spread outside the pancreas. Depending on the location, signs and symptoms of this cancer may vary. If the cancer is located on the upper part of the pancreas, the usual signs are vomiting and nausea, abdominal pain, dark urine, light stool, and jaundice. The patient will also have itching, swollen or enlarged lymph nodes in the neck, and sudden weight loss. If it is on the end part of the pancreas, the most likely indicators of the cancer are back pain, abdominal pain and weight loss. This cancer has classifications, which are based on the located affected. It depends on the area whether it is where the food is digested and turns into substances or the where food digested becomes hormones and insulin. The former is termed as exocrine, while the latter is endocrine. Therefore, types of pancreatic cancer are called as exocrine pancreatic cancer and endocrine pancreatic cancer. Exocrine pancreatic cancer is the most common. This is because the exocrine part is where the cancer starts. On the other hand, endocrine pancreatic cancer is rare. There no specific cause of this cancer. However, many possible risks can cause a person to have cancer in his or her pancreas. Somehow, the causes are due to poor and bad habits. The lifestyle of a person should be healthy, to make sure cancerous cells do not grow and spread in the body. For instance, smoking is bad to the health and it affects the pancreas. This kind of habit can be a primary risk, which suggested to be avoided. Some of the risk factors that can trigger pancreatic cancer are family history, race and age. These are the only causes that are initially checked. Pancreatic cancer can be treated in different ways. These include surgery to remove tumor, chemotherapy, radiation therapy, and palliative care. Traditionally, chemotherapy and radiation therapy go together to slow down the growth, as well as spread, of the cancer. Palliative care is conducted to lessen discomfort and reduce pain. When compared to other cancers, pancreatic cancer is not common. In fact, it is not included on the top 10 list of deadliest or most common cancers in the United States and also other parts of the world. Any cancer is due to unhealthy eating and avoiding exercising regularly. That is why physicians and nutrition experts strongly suggest to have regular workout and healthy living, including food consumption, in order to avoid cancers, like pancreatic cancer. Previous post: Parents Who Smoke – Have You Thought of Your Kids?